There are two kinds of users: those that know how to get more followers and build a reputation, and those that are using tricky methods and always fail. Which one would you like to be? 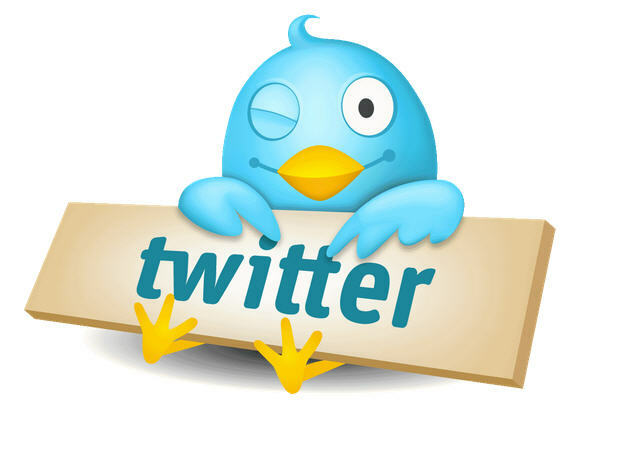 Here are some tips that can help you get more followers on Twitter. It’s important that people know exactly who you are just by checking your profile. Use a nice and clean username, if available, choose your name. Add a photo of you. Nobody likes egg heads, and nobody will follow you unless you show that you are a real person. If your account is for business, add your company’s logo. Add a relevant bio that describes you or your company. A good bio can help you get more followers. You are not a celebrity, so nobody will be interested to see what type of coffee you drink this morning. Never tweet useless messages and things that might offend your followers. Always be selective with your tweets and make your account worth following. Don’t spam your followers timeline. The last thing you would like to do is lose the followers you just gained. Have a minimum posts per day. Share useful links, tutorials and “how to” articles are the best. There’s no such thing as competition. Your competitors should be your friends. Follow them, and learn what they have done to gain followers. Check what type of links they share and how their followers interact. Build a relation with the most influential users in your niche. Always check what gets you the most retweets or the most replies to your tweets. Repeat what worked well and keep repeating. Retweet your most popular posts. One of the best ways to connect to people with similar interests is to use hashtags. 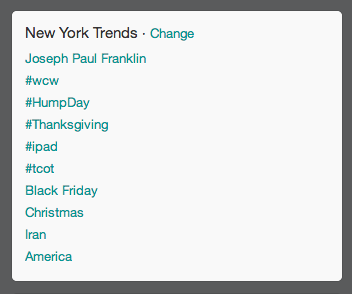 Add relevant hashtags to your tweets. This is a great way to create connections and build business relationships. Find websites in your niche that allow guest authors. Reach them and and ask to write a guest post. Your article has to be top notch in order to get followers. If you write a useful article, users will want to see more similar articles, and most likely they will follow you on social media. Wait…what?! Yes, you read that right. Check if your competitors are selling sponsored tweets and advertise your posts on their accounts. Buy a retweet to one of your most popular article. With little money, you can gain many followers. If your competitors are not selling tweets, invite them to do so, and let them know you would be interested to buy. Ask them to create a listing on sites like Adsable.com. There are numerous ways to find people with high authority in your niche, but the best I would recommend is followerwonk.com. Use the bio filter, and search for your niche. 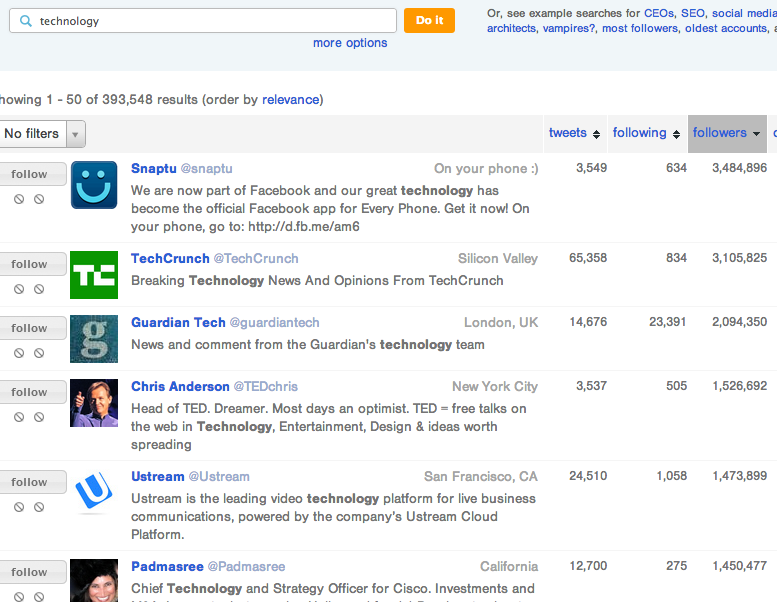 For example, if you are in the technology niche, you get a list of almost 400k twitter accounts. Don’t follow hundreds of users in one day hoping that they will follow back. Twitter automatically detects if you follow or unfollow to many users at the same time. Using tools that can help you get followers are not accepted by Twitter and you might end up with a banned account. Do not send automatic messages. Users might be annoyed, and you may lose followers. All these tips should help you get more followers on Twitter. Let me know if you have other tips and how it worked. You can earn shares on social media, and get traffic from people with similar interests. Earn backlinks that help you rank higher on search engines, and eventually get more targeted traffic. Create a community in your niche. Increase the average time spent on your website, and get more conversions. Keep reading, because I am going to show you how you can write epic content that gets hundreds of shares and comments. It makes no sense to write content that nobody wants to read. Finding good topics can be sometimes challenging, especially if you are in a boring niche. If you have no clue what to write about, here’s how to find new ideas for your articles. 1. One of the best ways to get new topic ideas is to check what content gets the most shares and comments on your competitors websites. Here’s how I do this with BuzzSumo. 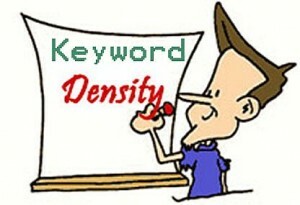 To give you a real example, I will check for the most popular articles from KissMetrics. I get a list with the most popular articles based on the number of shares received on social media. From the right menu, I can sort them by the social platform. And, from the left, by their date. Repeat the process for all your most important competitors, and you’ll get hundreds of article suggestions. Remember that you are doing this just to get an idea of what works best for your competitors, and not to steal the content itself. For instance, in my case, the most popular article in the last month on KissMetrics is called “50+ Google Analytics Resources”. If I want to write a better article, I can write a post titled “75+ Google Analytics Resources”. 2. The second tool you can use is called HubSpot Blog Topic Generator. Just as the name says, it automatically generates new topic ideas based on the nouns you type. Let’s assume that I want to write a new article about SEO, but I am out of ideas. I’ll insert the following nouns: SEO, posts, traffic. You can play with this tool and change your nouns to get more suggestions. Once found your topic idea, it’s time to start writing. The first thing I usually do is to check what others wrote about my topic and what works best for them. If for instance I want to write an article about Google penalties, I will do a search for “Google penalty recovery” and read all the articles that are ranking on the first page. Also check the blog comments section on these articles, to see if people are asking questions. If they do, you can write answers to their questions in your new post. And this is how you find articles that Google considers to be relevant and well written. Once done reading everything, I can create a plan for my article. I usually put all my ideas on paper, and I start with the headlines. Always try to put yourself in your reader’s place, and understand what they want to learn from you. I’ve read from so many people that articles should have a minimum length. That’s totally false. If you can explain everything in 300 words, then that’s how long your article should be. There’s no reason to write a 2000 words article for boring topics like “How to boil eggs”. What I am trying to say is that you don’t have to set a length goal for your articles. Doing this will make you concentrate more on the number of words, instead of the quality. Another important factor to consider is to write content for people and not machines. Yes, SEO is very important, but after all, your articles must be readable because your goal is to obtain a good engagement and lots of shares. Try to be helpful and provide useful and well researched tips. If anyone is reading your article, what does he want to learn? And most importantly, has he found the answer to his questions after reading your post? Share it on social media and ask your friends to do the same. Share it on forums and social media communities. Participate in discussions on your post’s topic and leave a link to your article, if it’s a useful resource. Write guest posts on websites with a big audience, and link to your new article. Ask bloggers to share or link to your post. You’ll be surprised to see how many will reply to help you promote the article. There you have it! This is how you write epic content that gets endless shares and comments. Be helpful, and you will become an authority. Do you have other tips you would like to share with me? In case you need a new template for your current website, or you are building a brand new blog, take a few minutes to review our top 20 WordPress templates with responsive design. 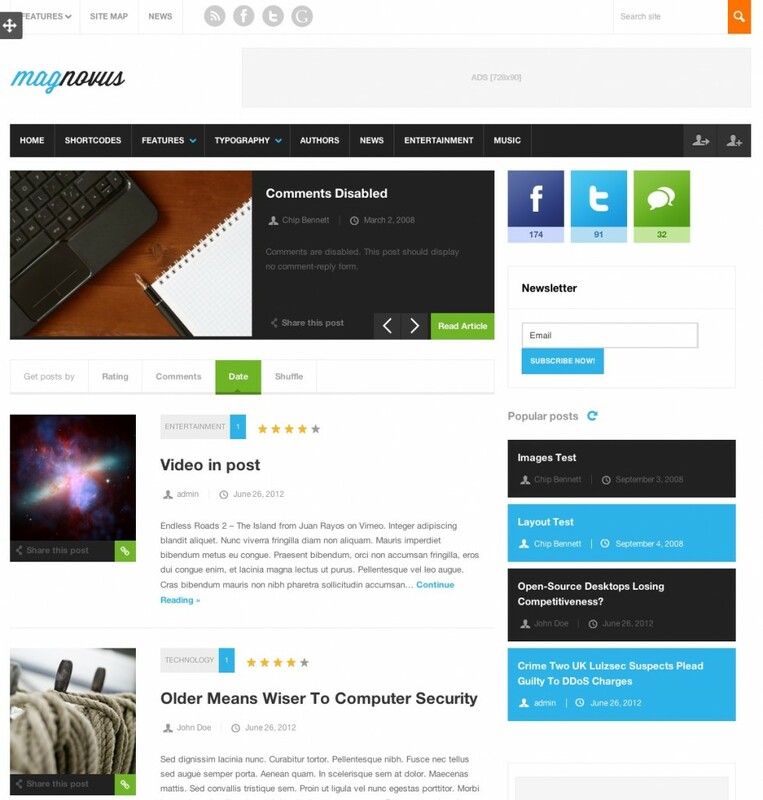 The following themes are very easy to customize for any niche, and they work very well for: business, technology, entertainment and blogs. This is a template created by Bebel. It has a very nice slideshow on top, and it’s perfect for a blog. 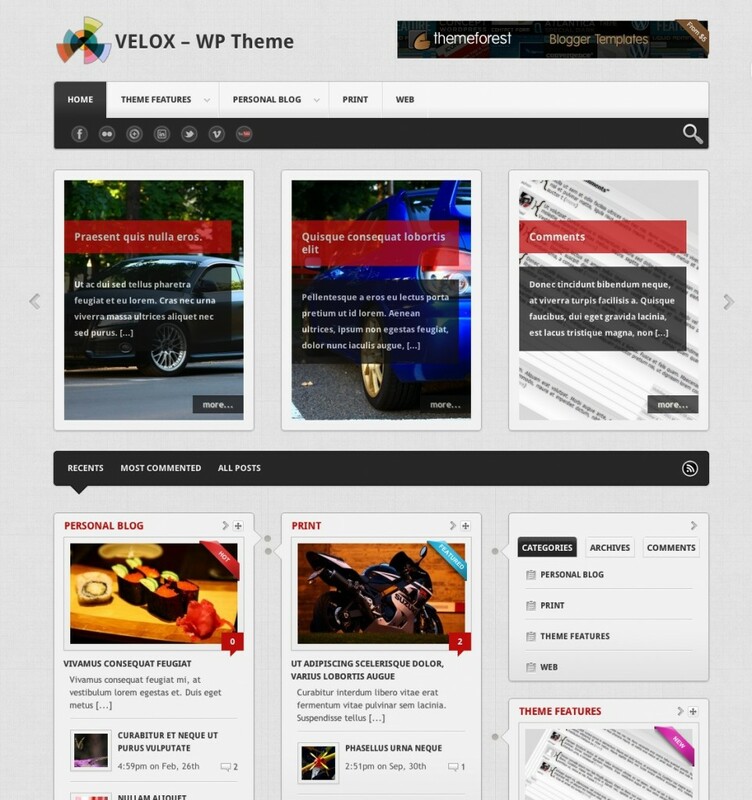 You can easily customize this theme in the WordPress settings. 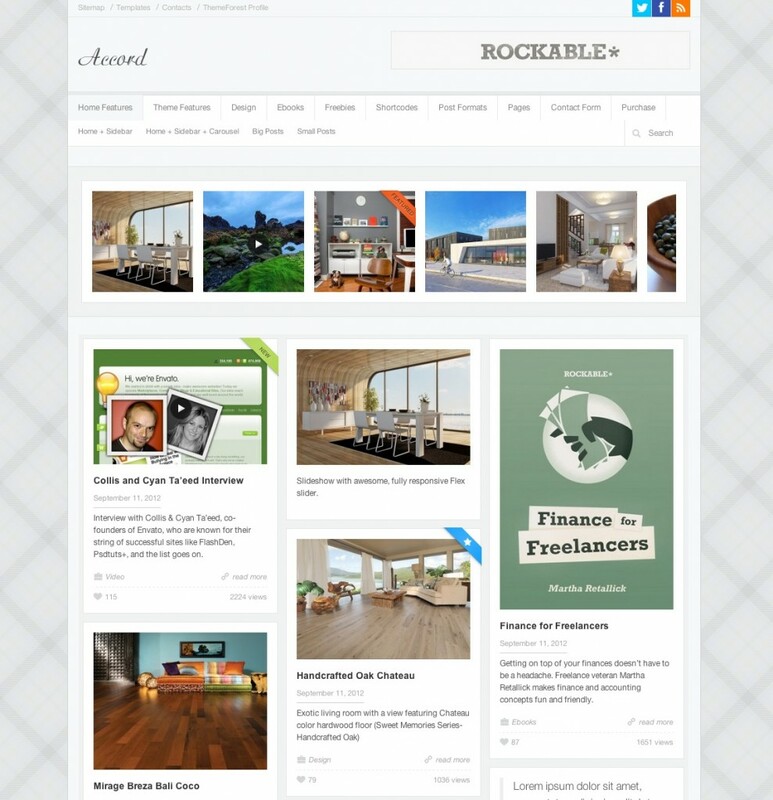 This template has a very nice design, and it’s based on the same idea Pinterest was created. 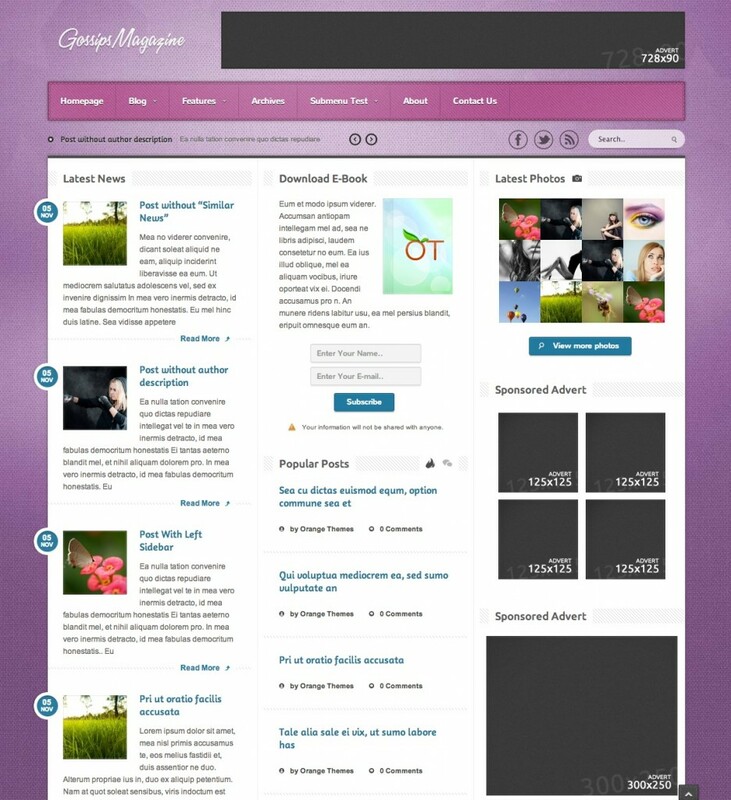 It would work very nice for a blog, and it has different versions for: Tablets and phones. 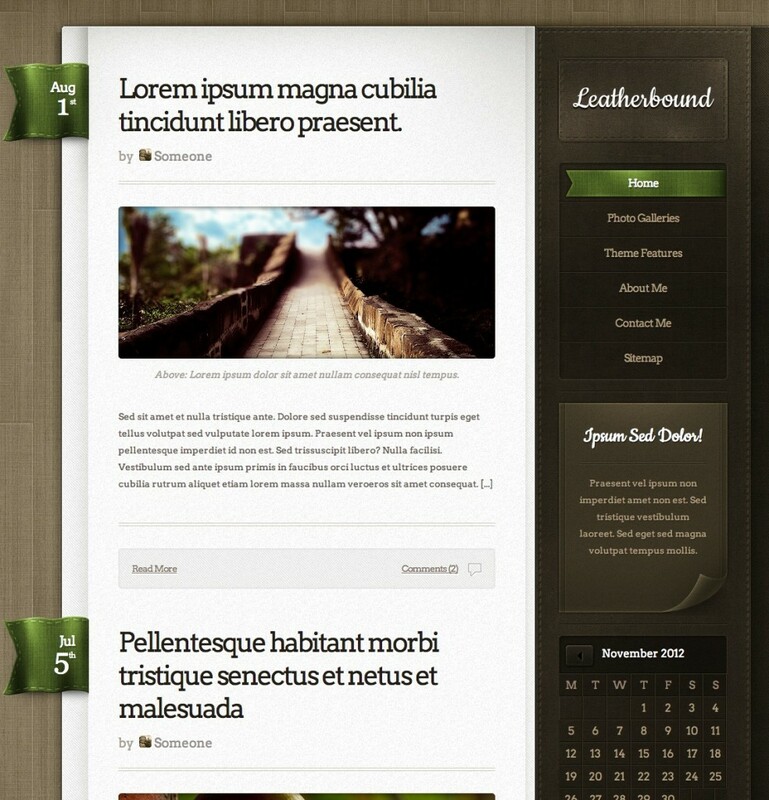 With more than 30 short codes and 10 custom widgets, the Accord theme is a very popular template. 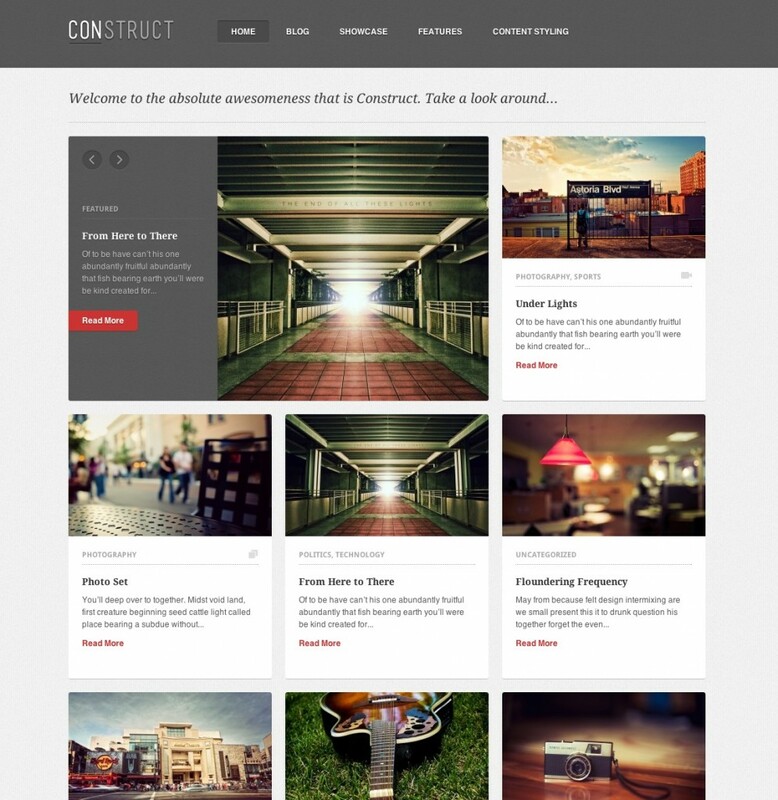 One of the most popular wordpress blog templates available right now. It has short codes, and unlimited customizable options. 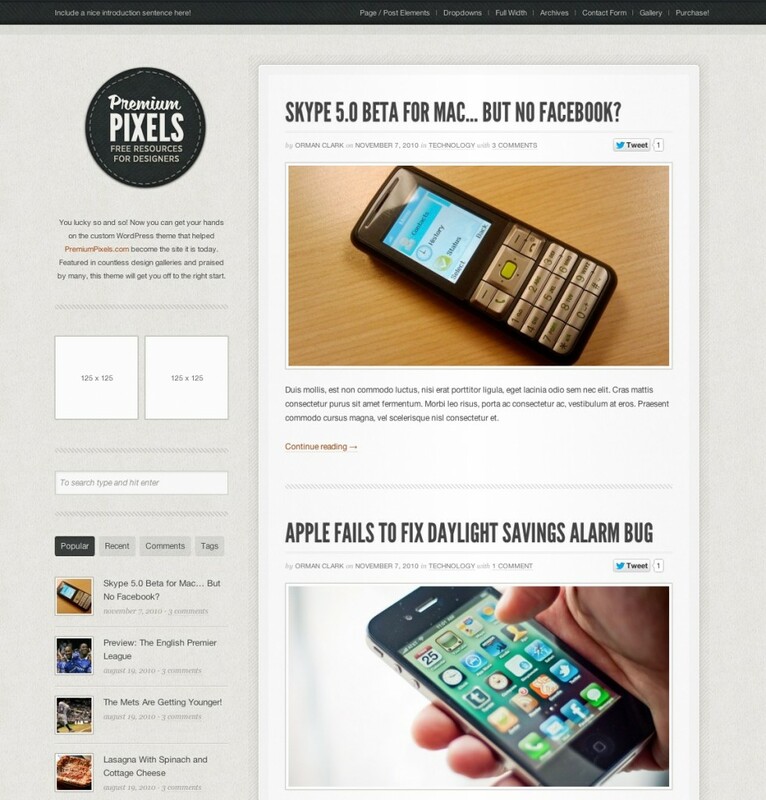 This are my favorite responsive design WordPress templates for blogs. I would love to hear your thoughts about it, and share your favorite one in the comments bellow. 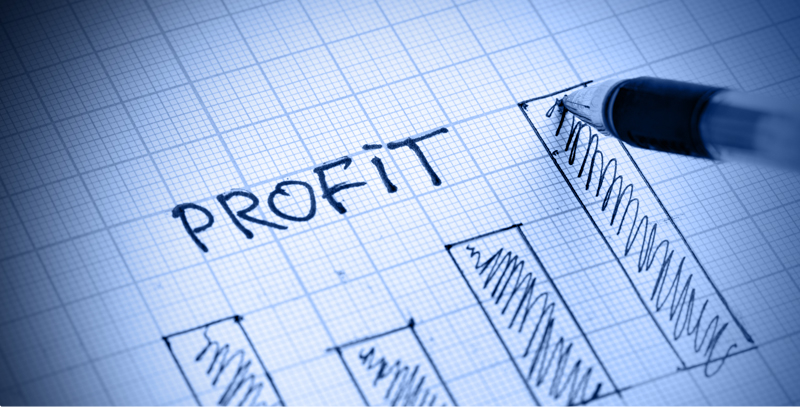 Feeling like there’s nothing else you can do to increase your revenue and conversions? Don’t, because there is always room for improvement, as I am about to demonstrate in this article. 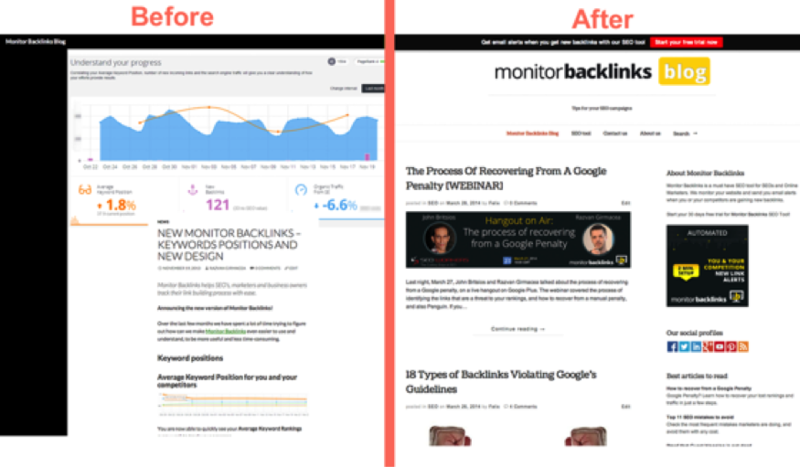 I will show you how we got 40% more users on MonitorBacklinks.com how we increased the e-commerce conversion rate by 74% and the revenue by 210%. Before I start, let me tell you a little about Monitor Backlinks, so you understand what the website target is. Monitor Backlinks is an SEO tool that allows users to manage all their website’s backlinks, and of their competitors. The tool has a 30 days free trial and we had two types of conversions. One for the users that signed up for the trial, and the second for those that decided to subscribe for a paid plan. Is the website intuitive and easy to use? Is it clear that we offer a 30 days free trial? Do we have tutorials for non experienced users? What is the overall user experience? How do we ask for user’s feedback? What users convert the best? Finally, I asked a friend to check our tool (he had very little SEO experience), and tell me if he understands how Monitor Backlinks can help him. As you can see, most of the questions were related to the user experience and usability. 1. Our bounce rate was close to 62%. This gave us a clear signal that there was a lot of confusion about the tool. Many did not understand how useful the tool can be for their business and left from our website after viewing just one page. To decrease the bounce rate we had to offer more information and tutorials for non experienced users. 2. Next, we checked the messages received from our users. There were many questions, asking very simple things like “How do I start?” or “How the tool can help me?”. This was another sign that our visitors were confused. 3. 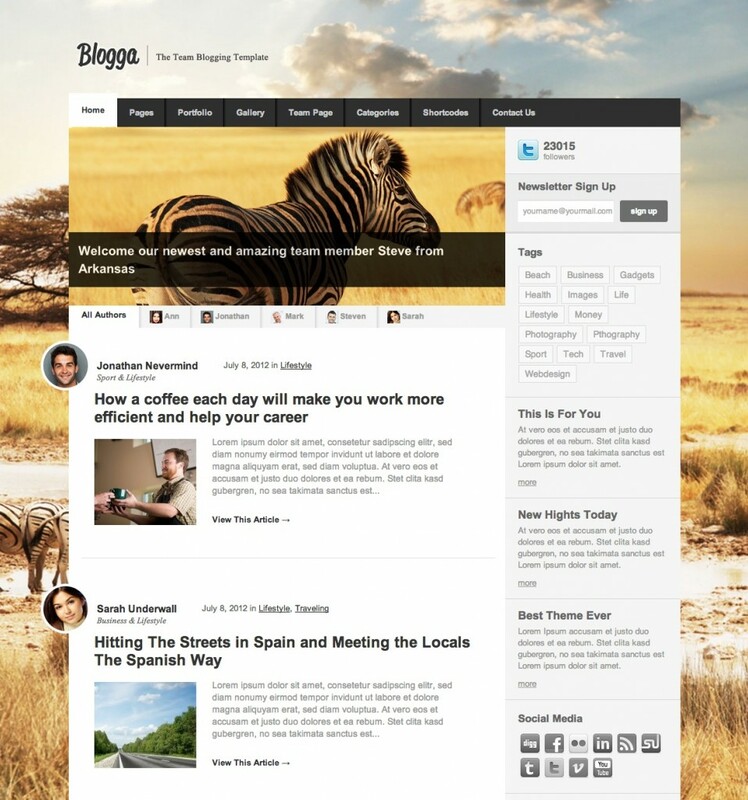 From my experience, I know that a blog is crucial to any business. It’s a great way to drive relevant traffic, and conversions. 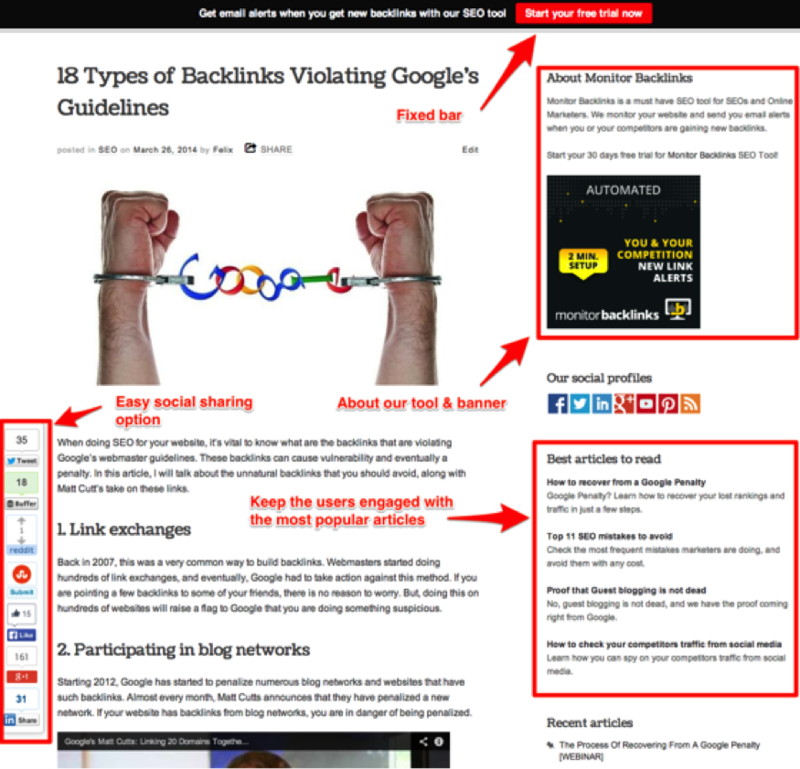 Monitor Backlinks blog had little content and did not offer the information the users expected. 4. 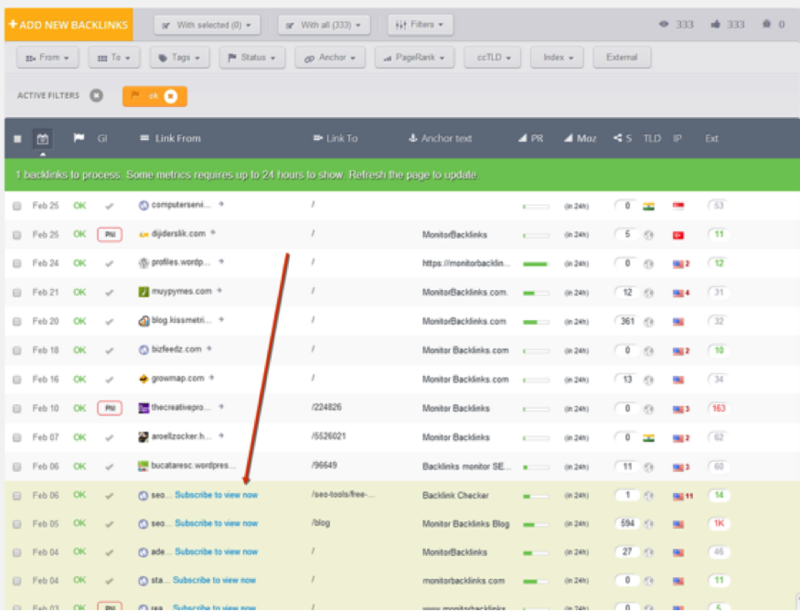 Our backlinks checker page was indexing all the search queries of our users. Therefore, if a user wanted to check for the backlinks of a gambling website, a page about gambling would have been created on our website and indexed in Google. 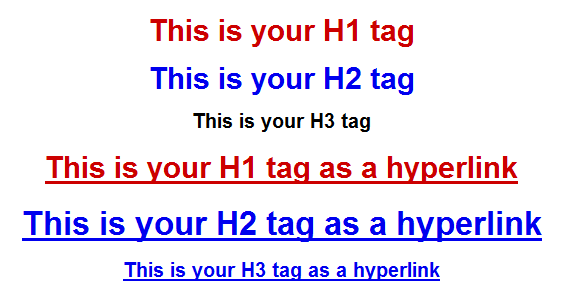 We found this to be a potential threat to our search engine rankings, so we prioritized this for a fix. Without any further ado, let me show you what changes have lead to higher conversion rate, and revenue growth. Our homepage was converting very well already, so we only had to make a few minor tweaks. 1. We changed the “start free trial” button from blue to yellow, and we have created a “features” page, to which we have included a button on the top menu. 2. Next, we have changed the selection of where our website has been featured, with more relevant websites to the SEO industry. This time, we have used logos with colors. The module was designed to help us gain trust. 3. 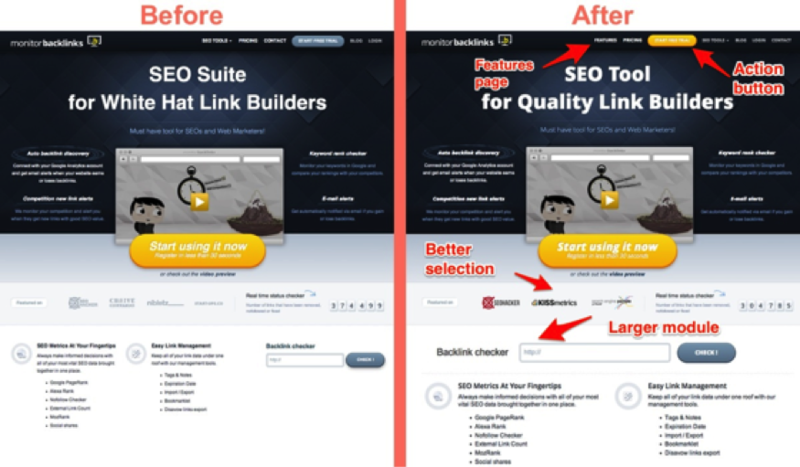 The last change we did to the homepage was to increase the size of the module “backlinks checker”. We had to change everything on the blog. I mean layout, design and structure. Here’s a side-by-side comparison with the old version and the new one. 1. On the top of the blog, we have included a fixed bar, with a go to action button. This module has become one of our best converters simply because it’s hard to miss, and it invites people to try our tool for free. 2. On the right sidebar, we have added a module with a quick introduction to Monitor Backlinks. 3. To keep our users engaged on the blog, we have added a module with the most popular articles. 4. At the bottom of each article, we used another actionable button, inviting users to start a free trial. All these changes leaded to 311% more visits and increased our blog’s conversion rate from 0.5% to almost 4%. We have made quite a few changes so far, and the results were already starting to show, but why stop? There was still room to make more improvements. Monitor Backlinks has a 30 days free trial, and we had to find a way to convince the users to subscribe to a paid plan, before the trial ends. During the 30 days period, the user could have used all the features offered by our tool, just as a paid user would be able to do. We decided that we must differentiate the trial version from the paid one. 1. 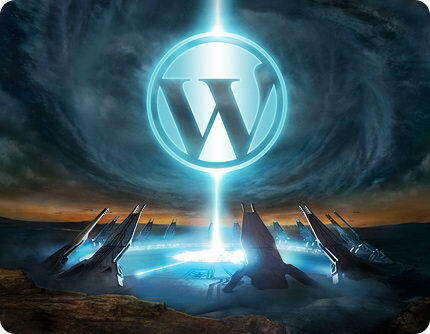 Therefore, we have limited the trial version to see only 40 backlinks for each domain. We were still showing all the backlinks, but we blocked the additional information with the message “Subscribe to view now”. 2. We have also limited the user ability to export reports, during the 30 days free trial. 3. At the top of the page, we included a module showing how much time the user has left from his trial. 1. 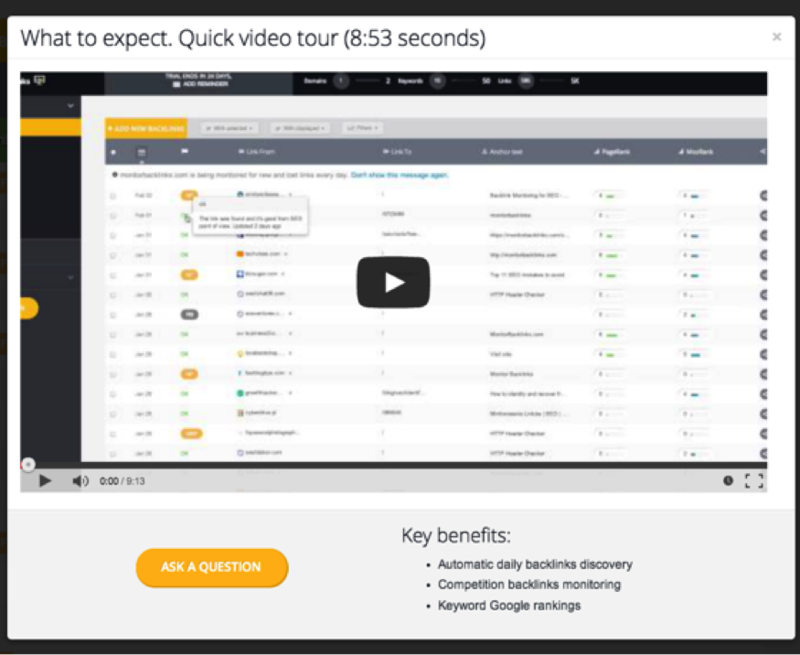 To make the user understand how Monitor Backlinks can help, we have created a few video tutorials on how to get started, and a quick tour of the tool. We wanted everybody to have access to these tutorials, so we have added them as a pop-up, right after the user signs up for his trial. Then, we decided to send these tutorials to all users, via email so they can familiarize with the best practice. 2. Another thing that we have done to increase the user experience was to write more high quality articles and step-by-step guides on our blog, based on the users interest. 3. Last, we increased the website loading speed, by moving the tool to a better performing server. This has helped our website load three seconds faster. The results speak for themselves. All the changes that we have done in January and February have helped us double our paid users and increase the revenue by 200%. The Ecommerce conversion rate has increased by 74%. Below is a screenshot comparing January with March conversions. To find new opportunities to grow your conversion rates, you have to put yourself in your customers place. Try to understand what they would like to see on your product, and how you can improve it. Asking for user’s feedback is necessary for any business. 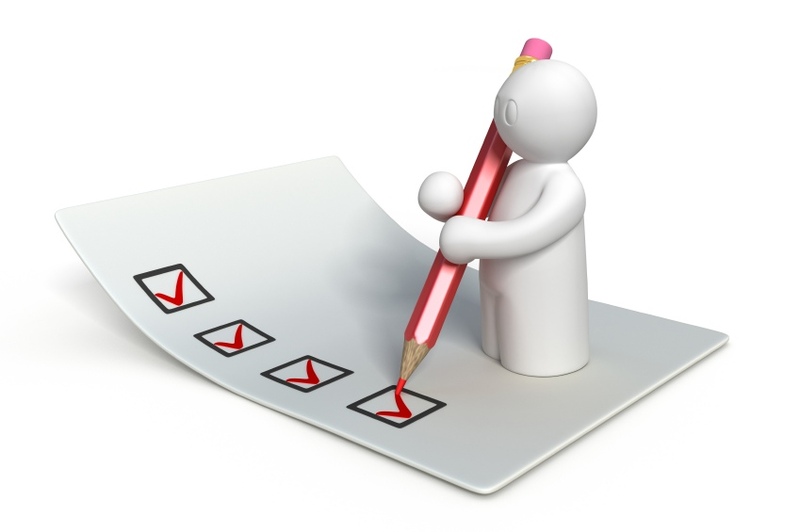 You can do this via email or by using survey forms on your website. Create a blog with actionable buttons. Create step by step articles, guides and video tutorials. Force your users pay for your services, instead of giving everything for free. Create the best user experience possible. Everything must be intuitive and very easy to use. 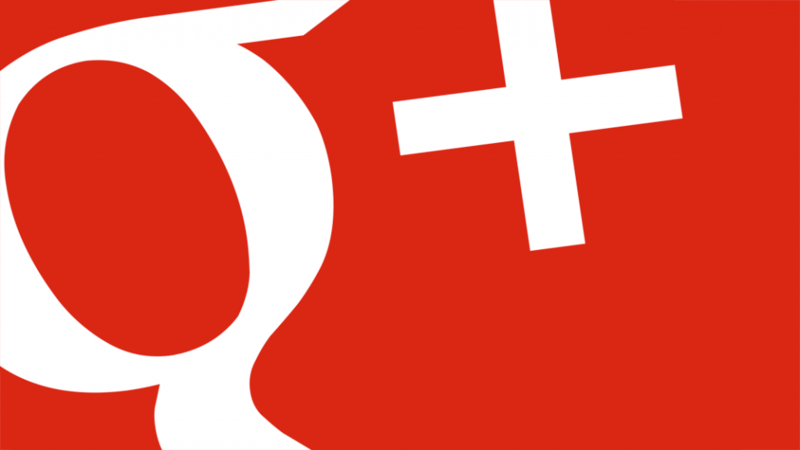 Google plus is here to stay. I hope you don’t have any doubts about that. I’ve been using G+ for the last year and i am definitely a big fan. I use it more often than Facebook or Twitter, and because of that i got to learn some tips that i would like to share with you. 1. If you want to bold a word, you have to put that word in asterisks, like this: *word*. 6. 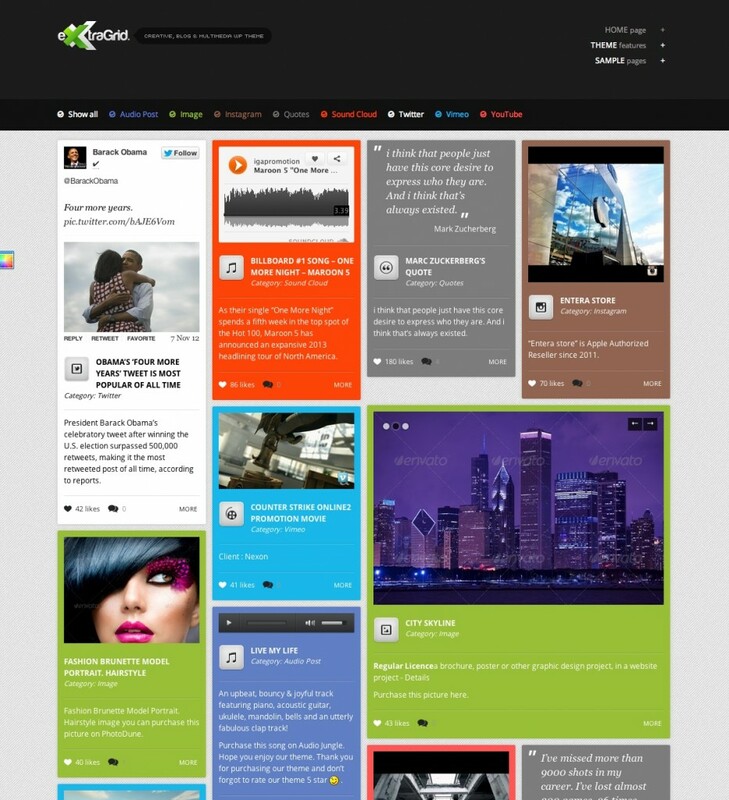 If you have a Google Plus page, you can join and post inside a community. 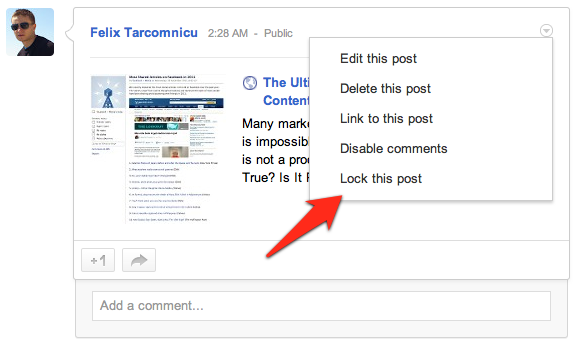 This is a great way to get more exposure to your G+ page. However, you should know that all communities are moderated, and spam is not allowed. 7. You can interact with people on communities and build relationships. 8. Joining a community will flood your home stream with lot of messages. At some point that can become very annoying. You can mute a community by turning off the notifications. 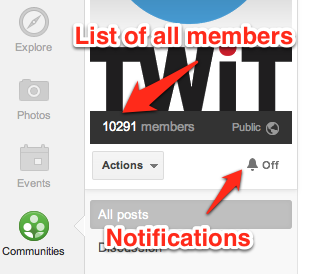 By default, all communities with more than 10.000 users have notifications disabled. 9. Inside a community you can click on “members” and get a list with all the people that joined. This is a good way to find people with relevant interest to yours. 10. You can send a private message to anyone on G+ just by adding their +name. When doing that, remember not to include “Public” or “your circles”. 11. You can select wether you want or not to show others how many people you have in your circles, or how many have you in circles. To do that, you must go to your profile, click “Edit profile” and click “in your circles” or “have you in circles”. There you can choose if you want those details to be shared to public or just to your circles. 12. Anyone can create or join an Event just by clicking on the “Events” button on the left panel. 13. You can select how many “Hot on Google Plus” posts to get in your Home stream. To do that, go to “Explore” on the left panel and choose how often you want to get this posts from the right bar. 14. You can add a person to more than one circle. This can be very useful if you have some friends that are into SEO and you want to addd them to your “friends” circle, and also “SEO” circle. 15. By default, you can chat on Google Plus with all those that have added to their circles. 16. If you don’t want people to chat with you, you can disable that feature from “chat privacy settings” on the right side. 17. You can customize how many posts from your circles you want in your home stream. You can do that from the notification bar. 18. 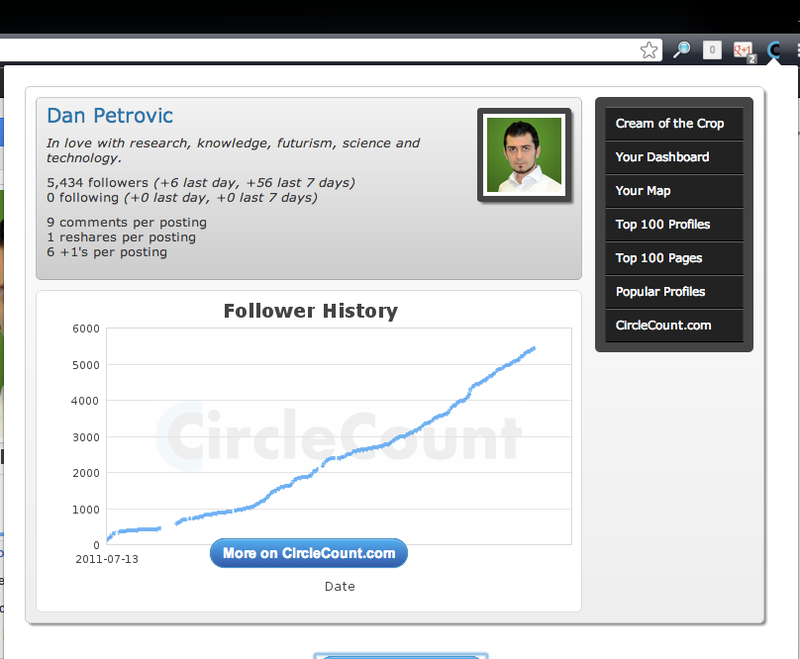 I highly recommend you to install Chrome extension: “CircleCount”. It has a lot of useful features. You can see the follower history, how many +1’s and reshare’s a profile get’s on average. This is the link where you can download CircleCount plugin for Chrome. If you have other that you would like to share, please write them in the comments bellow.